He’s not a household name here – but he is in Japan. PATRICK LAFCADIO HEARN isn’t a household name in Ireland, so you might be surprised to hear that this half-Irish, half-Greek writer is big in Japan. He’s so big, in fact, that there is even a museum in his honour in the country. His life story reads like a fantastical novel: born on a Greek island in the latter half of the 19th century, he lived in the US and Japan, wrote books and created illustrations, married the daughter of a samurai, is credited with creating the word ‘zombie’, and put New Orleans as we know it on the map. Have you ever heard the Japanese expression kirisute gomen? Spare me the Lafcadio Hearn, Blofeld. So, who was Lafcadio Hearn? Lafcadio Hearn didn't like to be pictured face-on, due to an injury to his eye. A writer, illustrator and intriguing character, his work is finally being brought to a wider Irish audience through a new exhibition at the Little Museum of Dublin. Hearn’s great grandson and his wife approached the Little Museum of Dublin to undertake the project, and they were helped by the Japanese Embassy and Japan Foundation with funding. 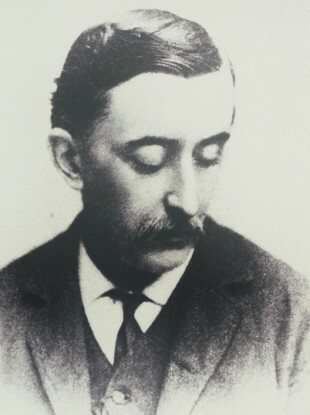 The result is Coming Home: the Open Mind of Patrick Lafcadio Hearn, which contains a number of items from the Lafcadio Hearn Memorial Museum in Matsue, Japan. “There’s this whole society of people around the world who are really devoted to this guy’s legacy,” curator Simon O’Connor told TheJournal.ie. His story begins on 27 June 1850, when Patrick Lefcadio Hearn was born to an Irish father and Greek mother on the Ionian island of Lefkada (which inspired his second name). After his parents split up, he was taken in by his grandaunt Sarah Brenane in Dublin, where he lived “a life of luxury”, said O’Connor. That included spending summers in Tramore and Cong. He went to Durham in the UK to finish his education, which was around the same time he dropped the name ‘Patrick’. Hearn went back and forth between Ireland and the UK until he went to the USA at the age of 19. He ended up in Cincinnati, where he got a job at the Cincinnati Daily Enquirer. He worked there as a reporter from 1872 to 1875. “He probably should be the patron saint of Irish journalists,” said O’Connor. In Ireland he is not known at all - in America he is known as a precursor to Norman Mailer and Hunter S Thompson. Two of his biggest stories for the Enquirer were about murders – he specialised in grisly “shock reporting”, as O’Connor put it. He then went on to report from the African American communities in the city. Immersing himself in life there, he was able to capture people’s stories vividly in articles reminiscent in style to the New Yorker’s ‘Talk of the Town’ section. O’Connor described his work as similar to that of Louis Theroux: witty, “totally detached, and nearly childlike”. In Cincinnati, Hearn married Matty Foley, an African American woman. This was illegal at the time (1874), and led to scandal for Hearn. By 1877, the couple was divorced, and Hearn travelled to New Orleans, where he lived for 10 years. He began writing for the Daily City Item in 1878, but also kept busying making woodcuts of daily life in New Orleans, which were published in the paper. “At the time there wasn’t really any writing about the place,” said O’Connor. Hearn brought New Orleans to a wider audience, and ended up writing a dictionary of Creole proverbs, a collection of Creole recipes, and even a novella based on what happened when a hurricane struck the area. “He pulled together all these cultural references which we commonly associate with New Orleans today,” said O’Connor. So if you think of voodoo, Creole cooking and colonialism when it comes to New Orleans, you probably have Hearn in part to thank for that. Hearn then moved to the West Indies as a correspondent, before moving to Japan in 1890. He soon fell in love with the country. Hearn became “infatuated” with Japan, said O’Connor. “This was the place he realised he would want to stay.” He observed the culture and wrote about it, just like in New Orleans. He married Koizumi Setsu, daughter of a samurai, and they had four children. He then became naturalised Japanese, and took the name Koizumi Yakumo. He also became a Buddhist. Hearn’s seminal book, Glimpses of Unfamiliar Japan, was published in 1894. “Japan had been quite closed down to the West,” pointed out O’Connor. Hearn captured the country in “a really colourful, interesting way”, introducing people abroad to the real Japan. Hearn became fascinated with Japanese folklore and ghost stories, and this infused his work. Some of his stories were adapted for the 1964 film Kwaidan. “He had this indelible mark on Japanese culture. He died in 1904 and he was the first westerner to be accorded a full Buddhist funeral,” said O’Connor. The story of his life is completely amazing. You would love to have his life as your CV. It’s so unusual. He travelled all over the world; he was excellent at everything he put his hand at. The Little Museum wants to bring Hearn’s work to a broader Irish audience, and afford his writing the sort of attention it gets in Japan. “We are doing this exhibition because we really believe in his legacy and we want to promote it in Dublin,” said O’Connor. Coming Home: the Open Mind of Patrick Lafcadio Hearn is on now at the Little Museum of Dublin, Stephen’s Green, Dublin. Email “This incredible Irishman is unknown in Ireland - but he's one of our greatest writers”. Feedback on “This incredible Irishman is unknown in Ireland - but he's one of our greatest writers”.